Who doesn’t love chocolate-covered strawberries? They are one of those sweet treats that just make you feel like you should be celebrating over a cold glass of champagne. Well, it was a little early in the day for some bubbly, so I decided to try and work these flavors into a more early-afternoon appropriate snack. What could be better than a warm muffin to start my day? I don’t normally eat chocolate this early in the day, but today I made an exception. And after what I tasted when I tried one straight out of the oven, it might just happen more often. 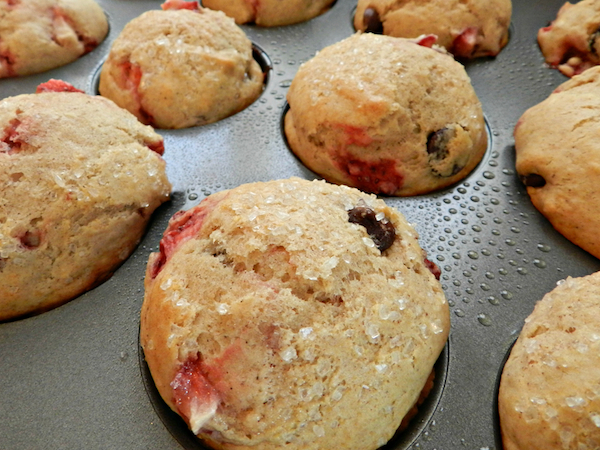 Preheat oven to 425 degrees F. Spray a muffin pan with non-stick spray or line with muffin tins. In a large mixing bowl, gently combine flour, baking powder, salt and cinnamon. Set aside. In another bowl, whisk together eggs and sugars until combined. Mix in milk, oil and vanilla. Fold wet ingredients into the flour mixture until just combined, being careful not to over-mix (the batter should be thick and slightly lumpy). 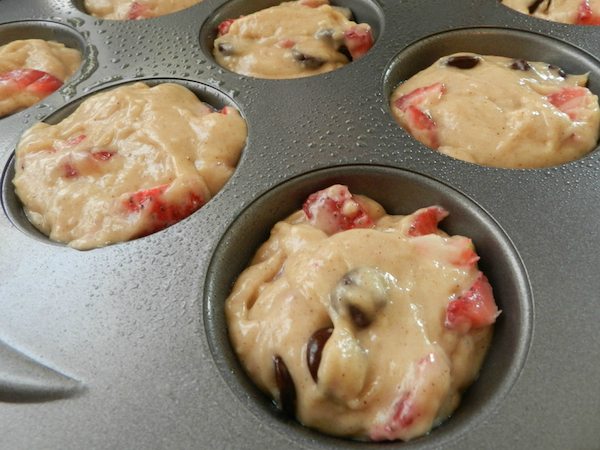 Carefully fold in the chocolate chips, followed by the strawberries. Pour the batter into the prepared muffin pan, filling each cavity to the top. Sprinkle the tops with coarse sugar. Bake the muffins at 425 degrees F for 4 minutes. Keeping the muffins in the oven, lower the temperature to 375 degrees F and continue to bake for 14 additional minutes or until a toothpick inserted in the middle of the muffins come out clean. Remove from oven and allow to cool for 10 minutes. 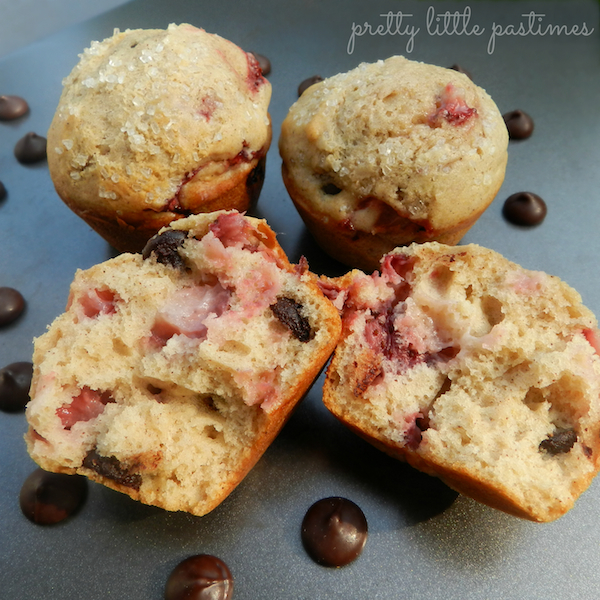 These muffins will taste best fresh from the oven, but can be stored in an airtight container for up to 5 days. I have some extras in the kitchen and will definitely serve them warm with some vanilla frozen yogurt or fresh whipped cream for dessert later. Enjoy!